I'm having FPS issues too, but mostly on DT maps. I'm usually at 70+ on base game maps (Siege aside) and getting high 30s/low 40s on DT. It's really frustrating, I'm probably not going to play much on the new maps because of it. 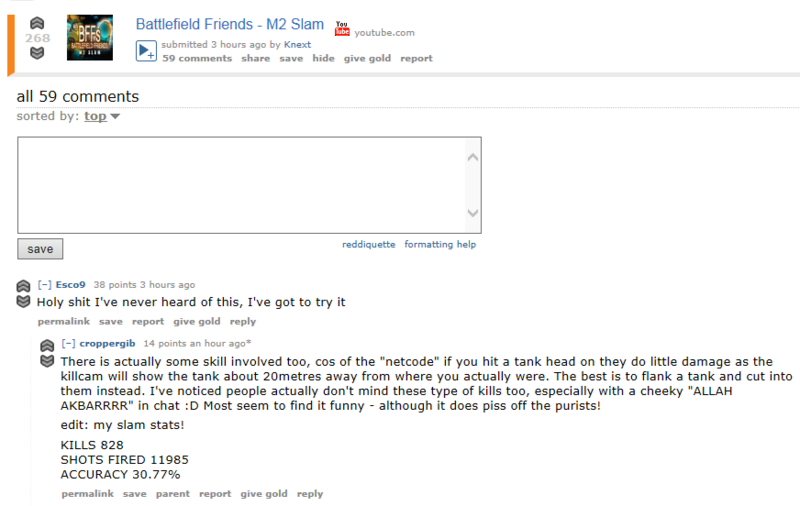 Except now the "netcode" appears to be broken again! It hasn't been this good outside of CTE. In fact, the .44 has been registering at least 33% of its shots, as opposed to 10%. shouldn't i get lower than you then? Little did he know he was already gay. "Wish you were a mime." This man is a genius! We shall call the in-game implementation of the "Iron Dome" something else. I'm pushing for "Man Portable Active Protection System." It'll act just like a vehicle's APS and intercept incoming explosives. Also, bonus REP to whoever can find this man's question! I'm a camper, which should make me invincible, but mortars and UCAVs keep killing me. Anyone got a solution, or do these things need a nerf?